Since their recent introduction, pita chips have given tortilla chips a run for their money as the preferable dipper for hummus, white bean dip, salsa, guacamole, and more. This Middle Eastern inspired chip is so easy to make, there is no need to buy a bag. Moreover, the homemade baked version is healthier and contains less sodium and calories. These chips take less than 10 minutes to make and are perfectly delicious. 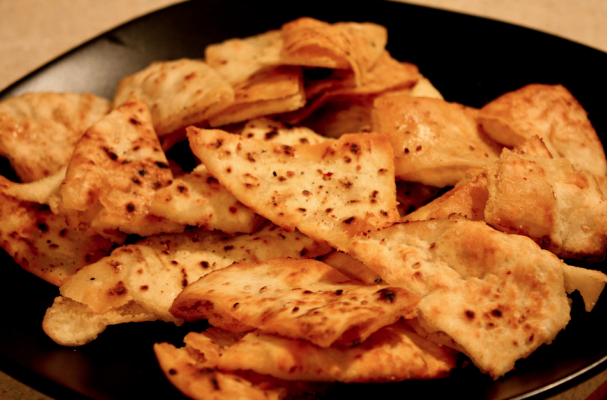 Essentially, pita bread is lightly coated in olive and dusted with sea salt before being baked in the oven. Whole wheat, white or other seasoned variety will work for this recipe. Also, feel free to add your own special touch coating your chips with a unique seasoning blend or tossing in fresh herbs. For a gluten-free baked pita chips, follow the same technique but use a gluten-free pita bread or brown rice tortillas instead. To learn how to make hummus, click here. For a variety of hummus recipes, click here.